I've been playing with the Rednano search engine since the ad popped up on my blog this week. It gives you Singapore relevant results for your search terms (and also an option for world results). I tried "PIE", "char kway teow", "mee goreng", "Airport Road" and "Camemberu" (hey, 8,665 results!). Not too bad - it really does sift out Singapore-based results. Biases against SPH aside, I have to say it's pretty cool. I like the clean interface and icon designs. You can search news, images, people, and even business directories. Rednano even has maps (by Singapore Land Authority). You can check locations of 4D booths, taxi stands, ERP gantries, schools, clinics, shopping malls, petrol stations etc. But oh, it doesn't show food centres!!!! How can this be??? What a glaring omission! 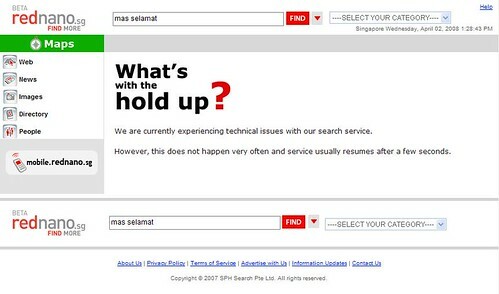 And guess what happened when I tried to locate whereabouts of Mas Selamat in Singapore? Hahaha! Rednano can't find Mas Selamat either, originally uploaded by Camemberu.